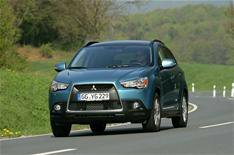 Mitsubishi ASX prices revealed | What Car? The Mitsubishi ASX crossover will cost from 14,999 when it goes on sale in July. Designed as a direct rival to the Nissan Qashqai, the ASX will come with a choice of two engines a 115bhp 1.6 petrol, or a 147bhp 1.8 diesel with prices starting at 14,999 for the entry-level petrol, rising to 22,049 for the range-topping four-wheel-drive diesel. An engine stop-start system, low-rolling-resistance tyres and regenerative braking help to produce impressively low CO2 emissions of between 135g/km and 150g/km. Average economy ranges from 47.1mpg to 51.4mpg. The ASX has the maximum five-star Euro NCAP crash-test rating, along with whiplash-reducing seats and up to seven airbags. There's also brake assist, stability and traction controls, and an emergency stop signal system which automatically switches on hazard warning lights.